It was such a pleasure to come back to this pretty little church in the rolling, remote hills to the south of Stowmarket. indeed, I have come this way several times in recent years, but unlike many of its near neighbours St Mary is kept locked, probably as a consequence of it being in a joint benefice with Combs. For several visits I had found the keyholders out, but at least Little Finborough has a keyholder notice. 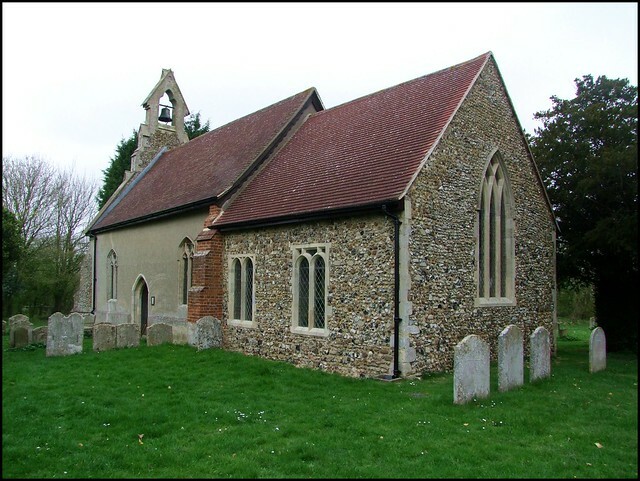 I am afraid that Combs, a much more significant building and in the first rank of Suffolk churches, does not. But in the spring of 2011 the friendly keyholder was about, and so I cycled back enthusiastically along the winding lane. The roads south of Stowmarket make no sense. They wind and dog-leg through the gentle hills, narrowing, doubling back, and sometimes disappearing altogether. Beyond Combs, they respond to the history of the land around them; they reveal the ancient field patterns in the way they zigzag along and above vanished strips, then turn abruptly short of the perimeter fence of the former RAF Wattisham. The open fields and secret copses spread for miles around, and on this bright day in late Autumn my view was enormous.Also enormous around here are the churches; great piles built on the spin-off wealth of the medieval Stour Valley. Here were the sheep that made the wool, here grew the crops that fed the workers that made the cloth; here was the breadbasket that made the Springs and Cloptons rich. They and their like built churches that are vast edifices; think of Combs, and Hitcham, and Hadleigh. Think even of Lavenham itself, only a few miles off. These churches are among England's most significant. Little Finborough is not one of them. Instead, the narrowing Combs Road reaches a woodland, three miles from town. 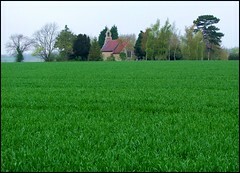 Across a recently sown field a tiny Hansel and Gretel of a church peeps through the cedars. There is no proper road to it. You take the driveway to Finborough Hall, and then turn off through the fields. There are no other houses. There is no village here; only Battisford, a mile away. The air was silent this day except for the wind and the birds. On the occasion of my first visit in the last years of the 20th Century, I had not seen a soul since leaving Combs, cycling out of the Gipping valley and then into the wilderness. Rooks cawed and wheeled out of the recently ploughed fields. A rabbit shook and shot into a ditch. And here, in the fields beside the graveyard, a group of wild deer cropped the early shoots of something - was it winter wheat? I didn't know enough to tell. They regarded me warily, fifty yards off, but didn't startle. I got off of my bike and pushed it through the mud, and I must have seemed a strange beast to them. The graveyard was an oasis in the bleakness; hedge- and ditch-surrounded, still verdant with the dampness of autumn. There are a number of 18th century graves to the south of the door, and the church itself is almost completely rebuilt in a sentimental 19th century manner. The whole thing is delightful. There never was a tower. The west end is entirely rebuilt; before 1856, there was a half-timbered wall here. The new wall supports the contemporary bell turret, and the window tracery is probably all pretty much original in the rebuilt walls. I wandered around the graveyard, exploring.Around on the north side, there is a little hut on wheels, being used as a storage shed. Mortlock tells us that it is a 19th century shepherds hut. As such, it must have once been common around these parts, although it recalled Thomas Hardy more to my mind than anything in Suffolk. To the east of the church is a vast slab of a mausoleum to the Crosse family, once guarded by iron railings. These were taken down in the Second World War, supposedly for recycling (although most of the scrap metal collected during that conflict seems to have been dumped in the North Sea afterwards) and now it looks an awesomely terrible thing, quite out of sorts and scale with this pretty place. This is a tiny church. When Mortlock came here in the late 1980s, it was still lit by oil lamps and candles. Now, there is electricity, but the oil lamps still hang here. One major discovery since my visit in 1998 is a section of wall painting uncovered beside the former north doorway. it appears to show a nobleman standing with his falcon on his wrist, and may well be part of a Three Living and Three Dead painting. The other most striking feature is a rare plaster tympanum, which once must have supported the rood. Since 1767, it has supported the royal arms of George III, which the Victorians never moved to the back of the church as they did almost everywhere else. It is one of the few sets of royal arms in Suffolk still in its original place. The font is a simple, 13th century affair, in use, on and off, for almost 700 years. The large decalogue panel on the north wall of the sanctuary is from the now-redundant church of St Nicholas, Wattisham. Wattisham once shared a Rector with this church, among others. Rectors are much thinner on the ground in Suffolk these days, but Little Finborough is surely lucky to be in a benefice only with busy Combs. This may well prove to be its salvation, because the balance of traditionalist services here, and the less formal ones at Combs, provides a kind of diversity, which may have as many worshippers heading up into the woods as flooding down to the ford below. But the extent to which people around here stick to their village might be judged by a conversation I had on my visit here in 1998. An old lady who I met on the track to the church let me in - I asked her if she was a church warden. "Oh no, dear", she replied. "There's so few of us here that we all have our own keys. It's better that way." We talked for a long time about this little church and its history; she mentioned vicars that she remembered from the past, and showed me a plaque on the front bench. "Now, he was a lovely man", she said. I looked more closely, and saw that the Vicar in question had died in 1937.